BCAA Complex 2200 provides 2,200 mg of pure, free form Branched Chain Amino Acids (BCAAs) per serving. These amino acids in their most easily assimilated form are essential for maximum muscle regeneration. 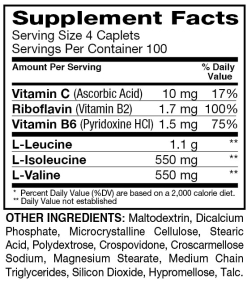 To use Bcaa Complex 2200 as a dietary supplement take four (4) caplets daily, or as recommended by a licensed nutritionalist or physician. Unlike other aminos muscles can use BCAAs directly for fuel when you train. BCAAs are used to repair muscle and in so doing builds more muscle. As bcaas are readily used for fuel by the muscles the longer and more intense you train the more BCAAs will be drawn from your muscles. To counteract this, take BCAA’s right before you train. BCAAs are readily available for use by muscles so taking bcaa’s directly before training will result in your energy levels being higher as these bcaa’s will be used immediately and prevent muscle loss. The best times to take bcaa’s are right before you start your workout and right after your workout. These are the critical time periods for taking BCAAs. 2 more caplets 15 to 30 minutes after training. 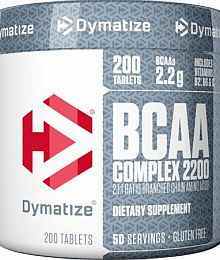 Dymatize was founded In 1994 to supply the highest quality nutritional supplements to college, olympic, and professional athletic programs around the world. These programs include pro football, basketball, hockey and baseball teams, to U.S. government programs such as the US Naval Academy. Now a leader in the Supplement industry, supplying only the highest quality nutritional supplements to millions of athletes & fitness enthusiasts all over the World. Distribution now covers over 50+ countries world wide.